Welcome to our farm! Here we keep farm animals including Shetland sheep, Nigerian Dwarf goats, Satin Angora and other fiber rabbits, many breeds of chickens, ducks, geese, turkeys, pheasants, peacocks, llamas, and donkeys. We are located in Skagit County in northwest Washington State. You can reach us by e-mail at donnawh@earthlink.net. Enjoy your visit, wear boots, and be careful where you step! This is our home. We purchased this farm in July 2002 and have been renovating since. We were able to move in January 2003 and were married here in July! We live near Sedro Woolley, about one hour north of Seattle, WA. You can reach us by e-mail at donnawh@earthlink.net. CLICK on the photo to be directed to the photos and story of our home’s renovation. These are some of our Shetland sheep. They are small, hardy sheep with a variety of fleece types and colors. CLICK on the photo to see photos of our sheep! These are some of our Nigerian Dwarf goats. As you can see they are small, colorful, friendly goats. They produce excellent milk for their size and make great pets. CLICK on the photo to see our goats! We are raising Satin Angora rabbits, partially for fiber. 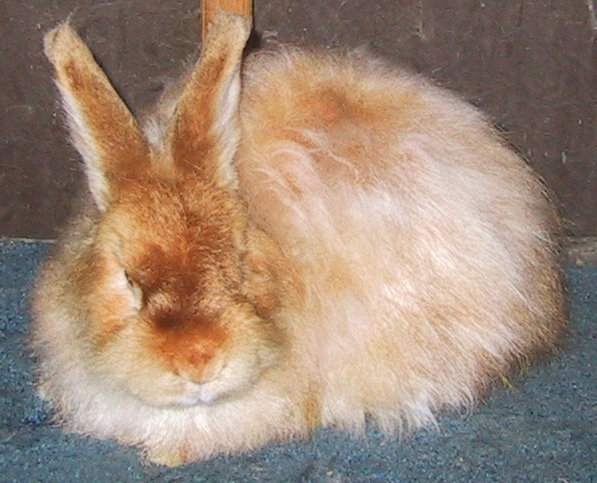 This is Red, our first Satin Angora. 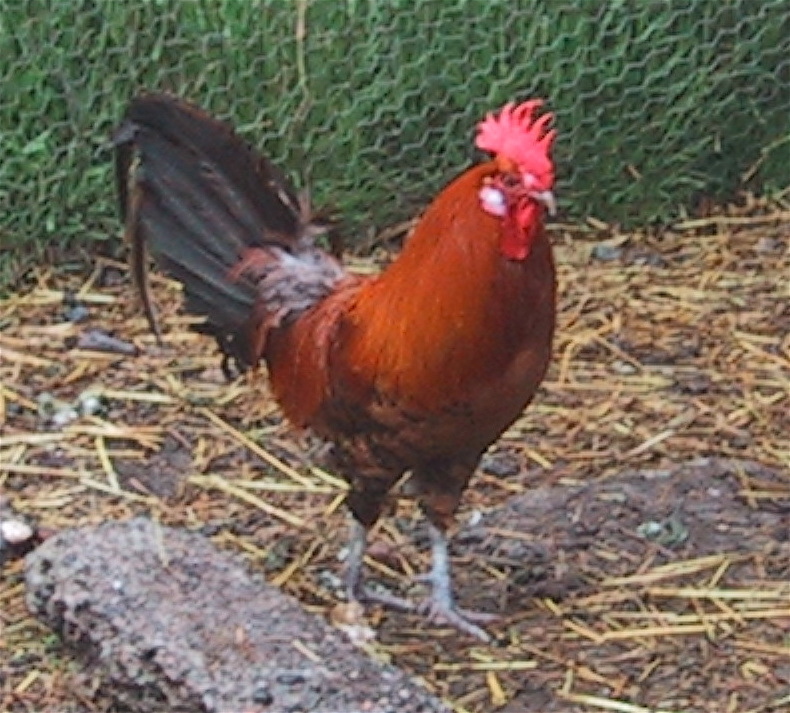 This is one of our roosters. We keep rare breeds of chickens, ducks, and geese. We rent our hens to people in the Seattle area who wish to keep chickens for laying and composting during the summer but do not wish to care for them on a permanent basis. We call it “rent a hen”. We also sell eggs out of our farm stand Redhead Produce. This is an example of some of the spinning fibers produced by animals from our farm. CLICK on the photo to be directed to our web page with more information on the fiber (wool, angora, or mohair) we have for sale. This is Tom with our Bronze tom turkey. We raise rare farm animals like this turkey. Love your blog! So much information. And so very different than-down-under-here where we are. Thanks for the compliment. Your blog is quite nice too! Hi, I just stumbled across your blog. You have a great looking blog. I have to ask though, would you be related to the Schoonovers in New York? Thanks for the compliment. To my knowledge my husband is only related to Schoonovers here in Washington, Oregon and California. Being raised a city girl, I only get to visit sites and I enjoyed reading the info you graciously provide. I love the animals and just adore the lovely pics of what it wound be like living the country life! Thanks Connie. I really appreciate your comments. Do you still have Lewis? Are we related? Tom does not look like anyone on our side of the family. I am decended from Grover Schoonover. The story I heard (not sure of it’s veracity) was that his father died when he was a little boy and his mother’s new husband did not want the boys. He and his brother Walter came to Oklahoma on a train with their names pinned to their coats. Their uncle raised them. I know that my dad (Melvin Schoonover) and his family took a road trip to Washington State to visit his dad’s family in a Model A or T car or truck. Their were pictures but they may have been lost. My brother may have them. I know that the name Schoonover is not a family name but the name of the town they came from: Schoonhoven. 2 men came over together to the New York City area when it was Dutch. They used the name Von Schoonhoven which became Schoonover. It is likely that their real surname was Hendrickson as that name appeared in the 2nd generation immigrant family names. We are not related that I can tell. I asked my husband, and he is not aware of a Melvin Schoonover in the family. The Schoonovers in his family live in Washington, Oregon and California. Tom’s looks come more from his mother’s side though. nice farm, we live on a farm to and look forward to getting fiber animals. Thanks. Fiber animals are a nice addition to any farm! nice farm, would like to some day get a farm of my own. I hope you are able to! Hello Christine! Yes we are. They are doing well and I have been taking them on walks around the property. How much do you “Rent a Hen” for?? Love the idea!! This is Jay from Indiana, Al’s nephew. Hi Cousin Jay! We rent them for $20 for three hens for the sumemr. It is not a lot of money but sicne we have plenty of chcikens, it cuts down on our feed bill. Plus they come back fat and happy, and we usually get the leftover feed donated to us too. So I think of it as a win-win. We only have one peacock, and I do not have any peacock feathers for sale. I am sorry I could not help you. Sorry, for some reason I was not notified about your comment. Thanks for the compliment. It is nice to see our wool being enjoyed! We do not sell chicken nor raw milk. So far we sell fibers, animals (lambs, kids, bunnies), meat (beef and lamb), eggs, fruits and vegetables. Interesting to see Shetland sheep in America. R S -shepherd – in Shetland Islands UK . Thanks Robert! So do you raise Shetland sheep there? I am curious what you think of our sheep in comparison to yours. We do not have any peafowl available at this time. Hi Donna! It’s Pat from Maple Falls! The three lambs I got from you are now 4 years old and still have 1 that is eleven yrs old from the first group! Everything going well here. I do have a favor…the person who had been shearing for me is now no longer available. I have several emails into different organizations to find a shearer and wanted to add you as a source if you knew anyone that could help me. Hope all is well there..your place looks full of fun indeed! Hi Pat! Good to hear from you. Glad the sheep are doing well. Our shearer comes from Wales and is not around now. I will ask around and get back to you. I’m Joanna Williams, & Al Showalter is my nephew. Am just wondering if you’ve ever heard of Helen Swartz. I do know she’s very big in sheep’s, spinning, & all kinds of stuff. She’s my first cousin. Hi Aunt Joanna! I have not heard of Helen Swartz but sounds like I should. I was just doing some searching and came across your site. Nice video. You seem to have a wide range of stock. If you want to learn more about Schoonovers, I can help. We were farmers up in New York State near Albany. I now live in Waynesboro, PA. I will pass this on to my husband Tom as he is the true Schoonover. Thanks Candis! I hope you enjoy it all. Hello, I am looking to buy a couple of satin angora does. Do you have any available for sale? Please contact me at sunnyjoyfarm@gmail.com Thank you! I will email you but I do not have any for sale. Are you the folks who have the cider press that has been at the harvest swap in years past? I’m hoping you will be out tomorrow at Belfast. I have apples! We are, but we are not going to the Harvest Market this year. Do you sell Shetland sheep? Hi Mo. I no longer breed or sell Shetland sheep. If you want to email me at donnawh@earthlink.net I can pass your information on to fellow shepherds that do sell them.